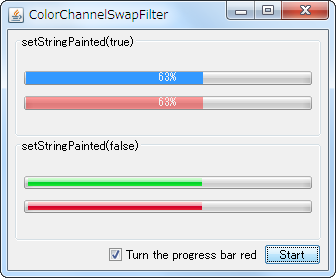 Uhm, did you know you can just use JProgressBar.setForground(java.awt.Color) ? Hi Jop, thanks for your comment. The second top `JProgressBar+setStringPainted(true)` is using `setForeground(...)` method. However, `setForeground(...)` have no effect on the second from the bottom `JProgressBar+setStringPainted(false)+WindowsLookAndFeel`. Plus, sets the foreground color of JProgressBar have different meanings to different `LookAndFeel`. For example, `NimbusLookAndFeel` foreground color mean to a progress string color not filled area color of progress.